Sarita Mathur has been setting the local literary scene alight with her writing and performance poetry. 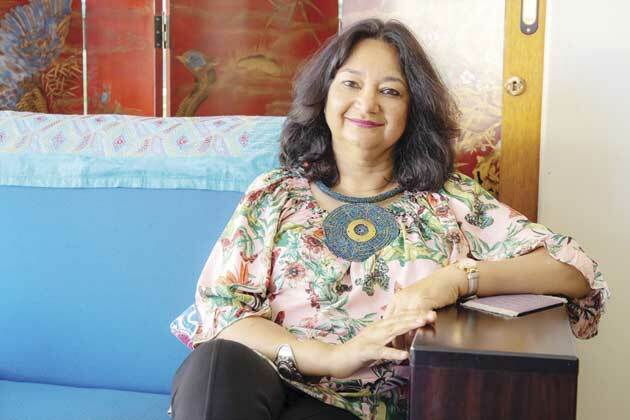 The Indian born author and poet shared her fascinating journey with The Chatsworth Tabloid. CT: Tell us about your upbringing in India ? SM: I was born and brought up in India. My father was in the Indian army and at the age of 11, I went to boarding school in the exotic Jaipur. Every three years, he was transferred to a different place so we got the opportunity to see and experience all parts of the country. Maharani Gayatri Devi, my alma mater, is a wonderful school and boarding school was a great experience. Besides academics, you make friends for life. After school, my father was transferred to Simla Western High Command so I had the opportunity to be with my parents and go to university in Simla where I studied and got Honours in English Literature. I always loved art and had a good eye for colour and design. I was advised to go in for textile designing but instead did a one year course in Advertising and Public Relations and later did a computer programming course in N.I.I.T. CT: For how long have you been living in Durban and what do you love about this beautiful city? SM: I have been living in Durban since 27 March 1995. I absolutely love Durban. It is full of rolling hills and beautiful beaches. Durban is a cultural melting pot of wonderful, varied people. They are open and friendly and welcoming to tourists. CT: How do you relate to South African Indians and do you feel that there is a difference between them and people born and brought up in India? SM: It is lovely to be able to interact with South African Indians. They are friendly and curious to know about you as a person. Many of them have been to India. Each person is unique and special. Their ideas range from just wanting to go and settle back in their homeland to just wanting to know more about the country. CT: Briefly tell us about your published work and achievements? SM: I have written a motivational book called “Once Again Love” with the subtitle being “Reconnecting with the Heart”. Besides tackling subjects like depression, it is a motivational book. It is written in both poetry and prose. Once again, love is about the inverted “V”. Life goes through up’s and downs but you can always get back to your upward pinnacle. My poem “Phenomenal Women” was awarded first prize by Oprah Magazine, South Africa, where it was published. I have been featured in the anthology, “Unbreaking the Rainbow” and the Hudson View. Very important for me, my poetry has often been published in the Idlers Column in The Mercury Newspaper. I was a guest speaker for the municipality at the libraries New Germany Branch and my book, Once Again Love has been accepted into all the libraries of South Africa from this year. The Time of the Writer Festival featured Drumbeats of Africa at the Elizabth Sneddon Theatre and I was one of the poets selected to recite my piece titled “Arise, Women of Africa. CT: Who are your favourite South African authors? SM: I first heard and read Nadine Gordimer while I was in Nigeria and absolutely loved her work, starting with a Guest of Honour. Gcina Hlophe is a wonderful poetess and storyteller and I love listening to her. Highly inspiring, she is a real natural and celebrates her heritage. CT: How did your love for poetry start? SM: I enjoyed writing poetry in school. We started writing poetry in Class 4 and from that time onwards, poetry flowed. I used to love writing about my friends and then a love of nature poetry came about. We had anthologies of poetry in every class and knew each poem by heart. In India, we had to memorize both plays and poems. CT: Please tell us what is the best poems you have ever written? SM: I have written a poem on phenomenal women which I absolutely love. It got first prize in a competition held by the Oprah Winfrey magazine. I am passionate about the poems I have written on Durban, my beautiful city. As a city, Durban inspires poets and authors to write, write and write. CT: Are you a cats or dogs person and why ? SM: I love dogs.They give you unconditional love and are always caring and affectionate as well as loyal and faithful. That’s why they are man’s best friend. CT: Describe a typical day in your life? SM: My day starts at the beach. Walking at the Golden Mile is rejuvenating and therapeutic. That happens at least thrice a week and the other four days, I am at the gym. I love reading, writing and painting. I taught Reiki for over 10 years and infuse reiki symbols into my paintings. It is very therapeutic. My husband and I play Bridge (card game and I call it the game of life) so a lot of work goes into that as well. My existence is happy and contented.